Auction begins at 9:00 AM. Thousands of lures from all makers, including: Creek Chub Bait Co., Heddon, Pflueger, Shakespeare, South Bend, Moonlight/Paw Paw, Jamison, and many more major manufacturers! K&K minnows including a rare Ghost, Bon-net, Gee Wiz, Flood, Babbitt, ABC, Bud Stewart, Lucid Lure, Bill Dewitt, Barracuda, FC Woods, Abbey & Imbrie, Harkauf, Pico, Spoon Fin, Hinckley, Darby, Snyder, H-I, Goble, Donaly, Porter, Decker, Outing, Johnson Auto Striker, Vann Clay, Medley’s, Al Foss, Wise Jim Dandys, Val Lures, Gayle, GEP, Hootenannas, Al Byler, Vom Hofe, Bleeder, Martin, Lloyd, McCagg, Hastings, Wilson, Pontiac Minnow, Glowurm, Rush Tangos of all types, Arbogast everything from Tin Liz baits to Jitterbugs, Floyd Roman, Dineen spinner, Stone’s baits, Charmer, Pocono baits, CC Roberts, Fisheretto, Danielson, Viking Frog, Kimmich, Paulson, Keller, Wright & McGill, Webber, and many, many more!! 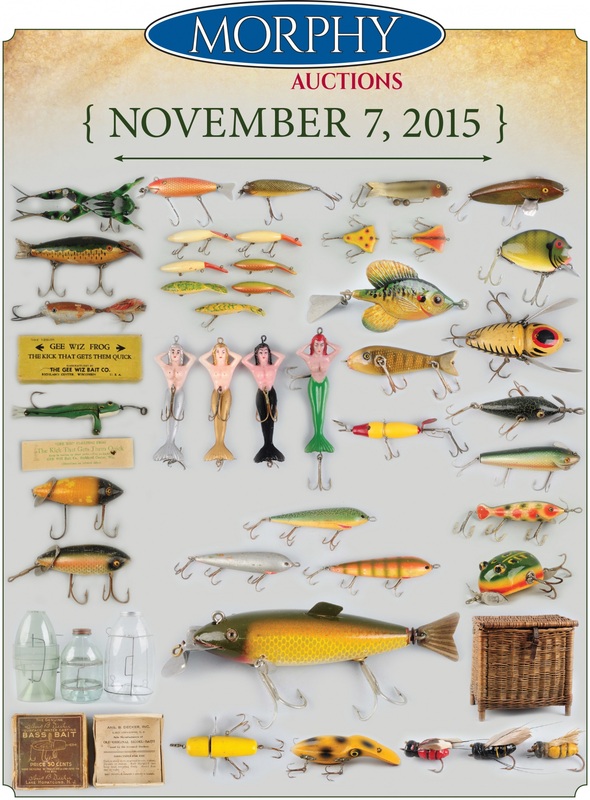 Extensive offerings of folk art baits, fly rod lures, hair baits, frog, mice, critters, pounds of metal baits, collectible and fishable baits, English baits, hooks and harnesses, empty lure boxes, tackle boxes both full and empty, boxed baits from many makers, and everything in between! Rods, reels, line spools, fish spears, nets, creels, glass, metal and plastic minnow traps, bait tins and cages, grabbers, gaffs, flags, display items, decorative items, fish heads and mounts, carvings, decoys, catalogues, paperwork, knives, and so much more! from beginning to advanced collector, dealers, decorators, and casual dabblers!